Lee County is being struck by two distinctly different, but significant, events – red tide in the Gulf and blue-green algae in the river and canals of the Caloosahatchee River. As South Florida enters the traditional dry season and water levels have declined on Lake Okeechobee, the U.S. Army Corps of Engineers has made operational changes to releases from Lake Okeechobee to the St. Lucie and the Caloosahatchee Rivers. The Corps has curtailed releases to the St. Lucie and has reduced releases to the Caloosahatchee. Both actions were taken at the request of local estuarine scientists. While the Caloosahatchee has experienced high flow discharges since June, a gradual step-down in releases is less stressful to the estuarine aquatic life. When changing from the high flows of the wet season to the low flows of the dry season, it is preferable to gradually acclimate the Caloosahatchee Estuary to dry season flows. This allows the mobile, predominately freshwater aquatic species, time to migrate upstream. It also allows for non-mobile aquatic species, which are salt tolerant, a period to gradually adapt to the new more brackish habitat. For optimal health of the Caloosahatchee Estuary, consistent dry season low-flows are necessary. Lee County will continue to work with the U.S. Army Corps of Engineers and the South Florida Water Management District to ensure adequate flows are provided to the Caloosahatchee throughout the dry season. •	The county’s recent efforts to remove blue-green algae totaled an investment of $2,010,000. 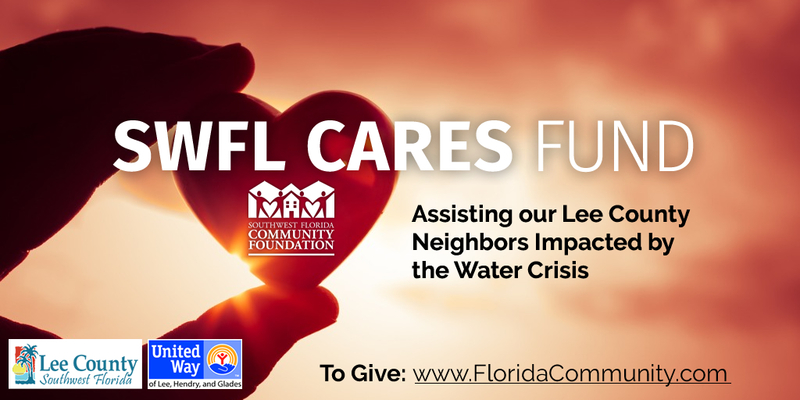 •	The Southwest Florida Community Foundation has partnered with United Way to established the SWFL Cares Fund to help individuals with incomes affected by the water crisis. •	The U.S. Small Business Administration (SBA) is providing low-interest loans for small businesses in counties affected by red tide and blue green algae. As the county and region continue to face harmful algae blooms, community leaders and officials announced on Monday, Aug. 27 a new donation fund, as well as assistance available to businesses set up by the Southwest Florida Community Foundation. The U.S. Small Business Administration (SBA) has issued a disaster declaration on red tide and a disaster declaration on the blue-green algae blooms that are caused by water releases from Lake Okeechobee. These disater declarations allow affected small businesses to apply for low-innerest Economic Injusry Disaster Loans from the SBA. The county has just obtained an additional $1,090,000 grant from the Florida Department of Environmental Protection for red tide cleanup, bringing the total to $3 million for this effort. In addition, the county's blue-green algae removal vendor will continue to collect algae through next week (a $2,010,000 effort in total). Between Aug. 1 and Sept. 11, the total amount of red tide marine debris collected by the county, its contractor and municipalities (Fort Myers Beach and Sanibel) total 4,143,577 pounds. Motorists who cross the Sanibel Causeway between 11 a.m. and 1 p.m. Saturday, Sept. 22, and Sunday, Sept. 23, will not have to pay a toll. A donation from the Southwest Florida Community Foundation will cover the costs during those hours as a way to encourage locals to support Captiva and Sanibel businesses, many of which are feeling economic impacts from the lingering red tide. Lee County Department of Transportation will place message boards today to inform motorists of the hours and dates when tolls will be covered by the foundation's donation. Efforts by the City of Sanibel and Lee County continue on the island's beaches and shorelines to pick up dead fish and other marine debris that has been killed by red tide and has washed inland. The City of Sanibel has suspended parking fees at all Sanibel beaches this month. The county fee waiver mirrors a decision last week by the Town of Fort Myers Beach to extend the free parking at its sites until the end of the month to assist businesses impacted by red tide. The Florida Department of Environmental Protection (DEP) has provided $3.9 million in funding to Lee County to support efforts to battle red tide and blue-green algae. This includes the previously announced dollar amounts from DEP of $1.9 million for red tide cleanup and $1.3 million for blue-green algae cleanup. Also included is an additional $750,000 that will be divided between the two cleanup efforts. Blue-green algae cleanup continues by the county’s vendor, AECOM, in Cape Coral canals. As of Monday, Sept. 17, the county contractor has collected and processed 275,000 gallons of algae slurry from six North Fort Myers canals and nine Cape Coral canals. County staff and DEP continue to discuss other types of cleanup technology. A demonstration project at no cost to the county by a company called Solitude Lake Management, which uses nano-bubble technology, is anticipated to begin on Sept. 24 in North Fort Myers. Red tide cleanup continues. Large quantities of marine life began washing ashore in Boca Grande, Captiva and Sanibel over the weekend of Sept. 15-16. The county continues to use county staff, Surf Rakes and its contracted CrowderGulf. At Tuesday’s (9/18) regularly scheduled BoCC meeting, commissioners will consider approval of the interlocal agreements for red tide reimbursement with municipalities. Staff continues to work with DEP for additional funding opportunities to continue efforts of red tide and blue-green algae cleanup. The county’s vendor AECOM, which continues to process slurry but had suspended collection Wednesday this week, will resume collections next week. 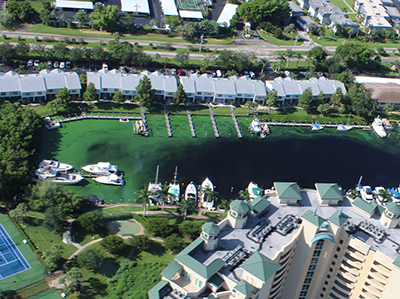 Aerial surveys by staff continue so we can better assess both blue-green algae and red tide impacts. Today’s flight indicates that the blue-green algae is starting to slowly recede. However, the seven-day forecast indicates further development with red-tide marine debris. •	The Florida Department of Environmental Protection (DEP) staff is discussing allocating additional funds in an amount to be determined for another demonstration project with a company called Ecosphere. •	Lee County is in contract negotiations with Ecosphere. •	Ecosphere and the county are working on a draft Work Plan for approval by DEP. •	Large quantities of marine life began washing ashore in northern Sanibel and Captiva Islands beaches Aug. 22. •	Easterly winds have prevailed since Aug. 27 and have helped push most of the floating fish away from shorelines and beaches and into the Gulf of Mexico. •	CrowderGulf, the county’s contracted vendor for red tide cleanup, has crews on boats sincd Aug. 22 collecting dead fish from the canals of St. James City, Upper Captiva’s Safety Harbor, South Seas’ Harbor and the eastern side of Captiva. •	Lee County Parks & Recreation staff members have maintained clean-up efforts at Lee County park locations with the assistance of the new Surf Rakes. •	48 tons of marine debris collected from Captiva from Aug. 22 through Aug. 27. •	2,100 tons of marine debris collected throughout Lee County. The County’s grant award from FDEP for both blue-green algae and red tide cleanup has been increased by $1.17 million. The total grant amount is now $3.17 million and includes: a) $1.26 million for blue-green algae remediation; and b) $1.91 million for red tide related efforts. Lee County anticipates resuming blue-green algae collection operations later this week and are working out details now with AECOM. Collection will likely begin in the City of Cape Coral, as this area apears to have the greatest number of severely impacted canals. Please note that Cape Coral is conducting its own demonstration project in conjunction with FDEP to determine the effectiveness of a product offered by Ecological Laboratories. Although the County is not a part of that project, staff will closely monitor its progress. Red tide cleanup crews have collected nearly 2,000 tons of marine related material county-wide. County staff continue daily cleanup operations and contract crews supplement beach and canal related efforts as needed. In the meantime, we are working with the County Attorney’s Office to get Interlocal Agreements in place with Fort Myers Beach and Sanibel that will allow the County to reimburse city expenditures for eligible cleanup costs. These reimbursements will be made from a combination of FDEP grant funds and Tourist Development Tax revenue. Businesses being affected by the Lake Okeechobee Blue-Green Algae and Red Tide are encouraged to complete a business damage assessment survey that can be accessed at https://floridadisaster.biz/BusinessDamageAssessments, and then select as applicable the “Lake Okeechobee Discharge/Algae Blooms” or the “Southwest Florida Red Tide” event. This is what Lee County – in conjunction with its cities – is doing to clean up these two events. Voted unanimously to ask for federal resources. The Board’s resolution urges President Trump to recognize a major disaster exists in Lee County because of the high concentration and prolonged presence of harmful red tide in the Gulf of Mexico and harmful blue-green algal blooms in the Caloosahatchee River and surrounding waters. The Board at its Aug. 21 meeting is anticipated to approve several agenda items that will use Tourist Development Tax reserve funds for beach cleanup and marketing (see below under “Coastal” update). Blue-green algae, cyanobacteria, is a phylum of bacteria. It can be found in almost every land and water habitat. It is photosynthetic and blooms are common in waters polluted by nitrogen wastes. It consumes water’s dissolved oxygen that can cause fish and other aquatic organisms to die. It can grow in fresh, brackish or marine water. Blooms happen when normally-occurring algae grows quickly. It initially causes the water to look cloudy and will start to form foam, scum or mats on the water surface and as the algae dies may cause the water to smell bad. These blooms can threaten animals, people and the environment. Animals and humans should avoid contact with bodies of water that have blooms present. Exposure to the blooms can cause runny eyes and nose, sore throat, allergic reactions and swallowing the water can cause a variety of illnesses including gastroenteritis. Humans are less likely to be affected by the bloom as they are put off by the look and smell of the water. Dogs are more likely to be affected by swimming in the water and either drinking directly or licking their fur after being in the water. Florida red tide is a common term describing a higher-than-normal concentration of a certain algae type. Most common to Florida and the Gulf of Mexico is Karenia brevis, K. brevis abbreviated. There are three components that are needed to form a bloom: biology, chemistry and physical conditions. The organism must be present in the water, have the nutrients to grow and conditions conducive to concentrate and transport K. brevis. Higher concentrations of K. brevis can discolor water to a red or brown color but the water could also remain its normal color. Florida red tide kills fish by producing a toxin called brevetoxin. This toxin affects the central nervous system of fish and can also affect birds, mammals and other marine animals. K. brevis can also affect humans, causing skin irritation and irritation to the respiratory system.